Let me firstly take a moment to introduce to you my new feature called Magazine Monday. If you’re a regular you’d know that I’ve been a part of the blogging world for 4 years this year and “Must Have Monday” was my first ever recurring feature but because of some personal hiccups I decided to ditch it and came up with Magazine Monday. What is Magazine Monday you ask? The magazine industry is something so close to my heart and someday hope to have a mashup between the magazine industry and retail as a career path. Obviously meaning that I have my nose in a magazine or online mags more often than not. Most of my inspiration for this little blog of mine comes from magazines. So Magazine Monday is focused at new trends be it beauty or fashion that I draw inspiration from and show you how to incorporate it with basic items that you already own. I have this thing where I anxiously await the announcement by Leatrice Eiseman from the Pantone Color Institute on which new shade is going to be the colour of the year. This woman travels the globe to find inspiration on her selection for colour of the year and this year it happens to be Marsala. Marsala is a deep red almost brown shade that I think is a spot on selection for the current season that we’re in and transitioning into winter. What makes Magazine Monday different to Fashion Friday? Magazine Monday features items beyond fashion and shows you how you can make whichever product I’m featuring – work with items/products that you already own! I decided to make my base shade white seeing that any white item be it a shirt or shoes are a staple in your wardrobe and steered away from darker shades because Marsala is quite a deep shade. Online stores are already overflowing with Marsala shaded items so there’s A LOT to choose from. What I love about Pantone’s colour selection this year is that its not very feminine so there’s so many things you could do with it. Also my makeup selection is pretty amazing too. 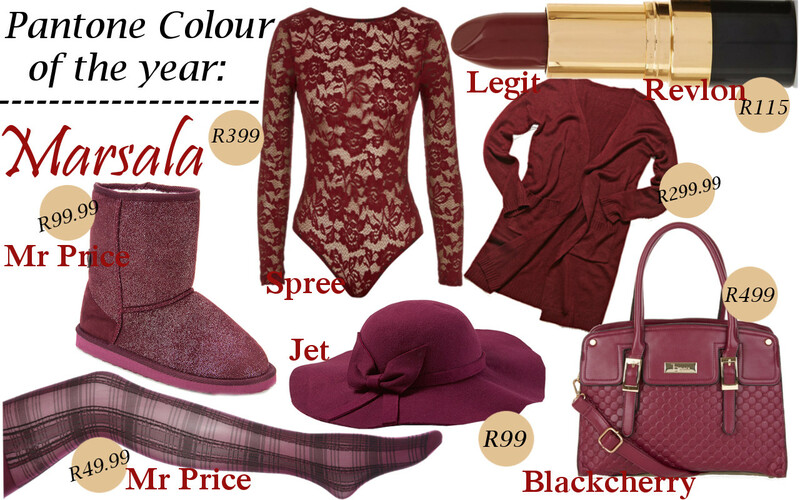 So will you be spicing(hehe no pun intended) up your wardrobe or makeup look with the Marsala trend? Tags: Accessories, Autumn, Beauty, Beauty Banter, Beauty Blogger, Beauty Brands, Beauty Products, Blackcherry, Blogger, Celebrities, Jeniffer Lopez, Jet, Lauren Conrad, Legit, Mr Price, Revlon, Selena Gomez, Shopping, Style, Style Inspiration, Zando. Bookmark the permalink. Great new feature and I love the Marsala shade!